A podcast, very simply, is a digital audio or video file that is available on the Internet for dowloading to devices. Typically these files (podcasts) are available as a series where new installments can be received by subscribers automatically. Podcasts can inform audiences, discuss important topics and share narratives. With podcast apps pre-installed on new Apple and Android devices, they are listened to by half of all households in the United States*. CIT&DL recently upgraded its Audio Studio (in RT 810 and 811) to produce several different kinds of media broadcasts. Podcasts are just one of them. 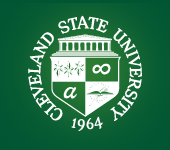 Faculty and staff producing a traditional, episode-based podcast that relates to their subject matter expertise, courses or work at Cleveland State. Hosting a live, Internet-based show on YouTube, Facebook Live or Twitch. Faculty and staff creating episode-based course content. Faculty partnering with our Center's staff to incorporate podcasting as an assignment for their students. Creating short messages and advertisements to be directed at a specific audience. IF I’M INTERESTED IN EXPERIMENTING WITH PODCASTING, WHAT SHOULD I DO NEXT? If you are interested in taking a tour of the studio or just want to talk about how you might incorporate podcasting work at Cleveland State, please contact Chris Rennison at x7582 - c.rennison@csuohio.edu or John Hubbard at x9707 - j.h.hubbard@csuohio.edu. If you are ready to record, please contact one of our media producers; Alex Barni at x5210 - a.barni@csuohio.edu or Al Nozak at x5219 - a.nozak@csuohio.edu.